David Norris: If I'm not supposed to be with her, why do I feel this way? If you knew that being with you meant that the person you love would never realize his or her dreams, would you walk away from them? If you wanted to, would you even be capable? As interesting a question as it is, it is the kind of question that hardly anything good can come from. If you want to stay, you’re selfish. If you want to go, then you don’t think love matters as much as success does. Regardless of your decision, you won’t be happy either way, but I suppose it got you thinking and that alone has its own value these days. Take that question and throw it into the central story of a movie though and you might have yourself with a pretty compelling drama. 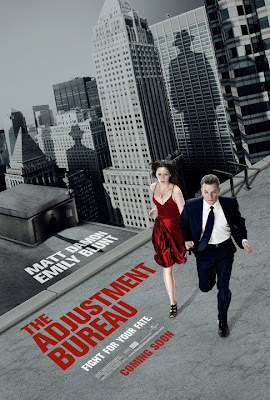 Or you might find yourself fully dismayed and just watching THE ADJUSTMENT BUREAU. Matt Damon, whose film choices as of late have all fell flat for me, plays David Norris, the youngest Congressman in American history, in George Nolfi’s directorial debut. Nolfi and Damon last worked together on THE BOURNE ULTIMATUM, which Nolfi wrote and Damon starred in. Sadly, their relationship did not end there and, if I am meant to take anything away from their latest collaboration, it would be that it was obviously not meant to. 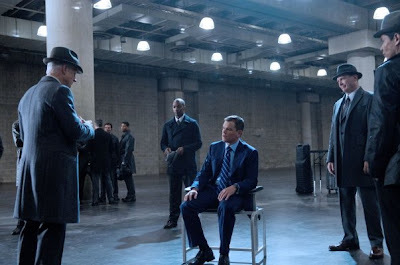 The men who work at this particular bureau all wear snazzy hats and sharp suits but they might as well be wearing sparkly fairy dresses covered in pixie dust, given what their jobs are. These men, who may or may not in fact be angels, are making sure every day that the plan in place for every person on the planet is carried out properly. To do this, they must meddle with humanity as inconspicuously as possible. These are the guys who hide your keys in the morning or spill coffee on your clean shirt so that you leave the house five minutes later and either miss or catch the moment you were intended to. And see, I always thought that was the work of garden gnomes. 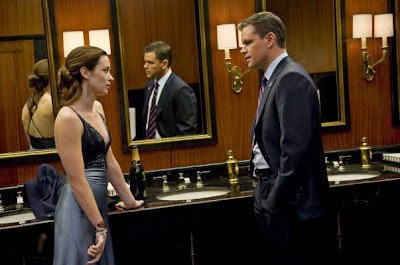 Damon meets Emily Blunt’s Elise in a bathroom. The seemingly chance encounter was not at all what it seemed and the two hit it off splendidly. Suddenly though, she must flee, and unlike Cinderella, she leaves neither her name nor her slipper behind. That was supposed to be the end of it, or at least according to the plan it was. The kiss they shared was too good to be forgotten though and neither can get the other out of their heads. The bureau simply cannot have this; it is not in the plan. And so the men in suits and hats do everything in their power to keep these two lovebirds apart. They point their fingers at peoples’ phones and messages appear or they flash a look in another direction and cabs go off duty. I half expected them to start wiggling their noses and disappearing in clouds of smoke at one point. They do all this to prevent Damon and Blunt from having a moment that might lead to a kiss, for a real kiss could alter their universes forever. As laughable and trivial as that sounds, it actually happens in the movie. THE ADJUSTMENT BUREAU clearly wants to come off as cool but really only comes off as trying too hard. Nolfi’s direction is sorely uneven but with such a weak script, it could not have been easy to make the actors sound convincing. Granted, he wrote the script as well so blaming the writer is just more blame on him. Nolfi strives to get the viewer lost in the perilous divide between fate and chance, all the while trying to figure where free will fits in to the mix. All he does is pose the question though without drawing any actual conclusions. If we actually have free will, I suggest you exercise it and avoid this movie. If our fates are already decided though, I hope you, like me, were not just meant to suffer through this movie. How I Ate My Heart Out for Valentine's Day.